Motul MC care P4 E.Z. Lube is a multi-purpose fluid lubricant: unblocks, lubricates and protects from corrosion all metal parts by depositing a protective film. 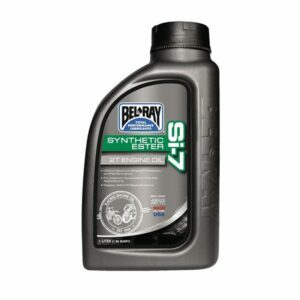 Bel-Ray® Si-7 Full Synthetic 2T Engine Oil is a 2-stroke motorcycle oil specifically formulated for use in injector/autolube systems, but can be used as pre-mix. Formulated to reduce smoke and carbon residue while providing the highest level of protection for all 2-stroke engines. Bel-Ray Si-7 meets the JASO FD and ISO-L-EGD ratings ensuring the highest level of detergency for better performing, longer running engines. 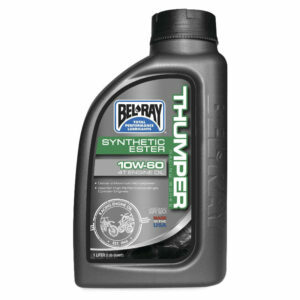 Bel-Ray® High Performance Fork Oil is a front suspension oil formulated for use in all suspension forks including those using cartridge and dual chamber systems. Through the use of carefully selected high-viscosity base oils, fade is reduced providing smooth operation over a wide temperature range. 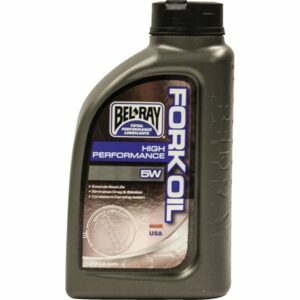 Bel-Ray High Performance Fork Oil eliminates stiction and drag while greatly improving fork action. 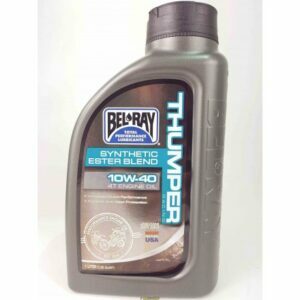 Bel-Ray® Thumper Racing Synthetic Ester Blend 4T Engine Oil is a 4-stroke motorcycle racing oil that combines the finest quality synthetic esters and highly-refined mineral base oils specifically engineered for today’s 4-stroke single cylinder, multi-valve racing engines. Provides maximum anti-wear protection for valve-trains, rings, cylinders and pistons. Delivers maximum horsepower while providing consistent clutch performance. Meets API SN and JASO MA2 requirements. Suitable for air-cooled/liquid-cooled 4-stroke engines and wet clutches. Silicone Detailer & Protectant Spray is a premium product specially formulated to provide a spectacular finish to all plastic and metal surfaces. This product is designed to resist the attraction of dust and dirt on the surface of parts treated with Silicone Detailer & Protectant Spray. It is formulated with inert chemicals that will not react with paint, metals or plastics but still binds well to surfaces. Silicone Detailer & Protectant Spray will tenaciously hold onto surfaces without running off. The coating is easily removed after use and will not persist on surfaces after being properly washed off.